The Madhouse Update: Former Commies in charge! "He won't let us down". "I believe Mrs. Thatcher's emphasis on enterprise was right". "The Thatcher-Reagan leadership of the 1980s got certain things right". And yet, New Labour top guns, Jack Straw, John Reid, Alan Milburn, Stephen 'Lyers' Byers, Charlie Whelan, Gordon Brown's spin-doctor, and Peter 'Prince of Darkness' Mandelson were all communists in their younger days. And the youthful Miliband brothers are the sons of a Jewish immigrant, who spent his adult life eulogising his fellow Jew, Karl Marx, and hawking the obnoxious German's communistic philosophies around the British university circuit. Let's take a closer look at a former Socialist Workers Party apparachik. In January 1998, when questioned on Radio Five Live, Stephen Byers, who was Schools Standards Minister at the time, declared that 8 x 7 equalled 54. Not exactly what you want as a Schools Standards Minister. "Wealth creation is now more important than wealth distribution". "The Party is intensely relaxed about people getting filthy rich". "In the urgent need to remove rigidities and incorporate flexibility in capital, product and labour markets, we are all 'Thatcherite' now." Which just goes to show that, once the average Marxist has slithered to the top of the greasy pole, he isn't necessarily the shiny-eyed idealist he once was. "Stephen Byers, the Transport Secretary, is the most unpopular member of the Government, according to an ICM poll. His personal poll rating has fallen to minus 49 points, says the survey for The Guardian. It is lower than Margaret Thatcher achieved at the height of the Tories' unpopularity in the late 1980s". "Political rumours were rife in Westminster this week that discredited former transport secretary Stephen Byers was favourite to take over the chairmanship of the Labour Friends of Israel lobby group. Jewish leaders have thrown their support behind the politican". "I will be very happy if Stephen Byers accepts a major position with LFI and I hope he does. He has always been very pro-Israel and a good friend of the Jewish people". "I think he is the best man for the job. He has been a good friend to the community in the past, which goes beyond anything in his own constituency. I also think he is someone that can deliver the goods. He has good contacts and this will be very helpful in these difficult times, especially in terms of media coverage". Mr Byers, who resigned his ministerial post in June amid a crescendo of criticism over his stewardship of the department, has a strong record of support for UK-Israel ties and Jewish community concerns. As Trade and Industry Secretary, he signed the Britech agreement, encouraging research co-operation between British and Israeli high-tech companies. Earlier this year, he joined Chief Rabbi Dr Jonathan Sacks in a visit to Finsbury Park Synagogue after a desecration attack. With Labour in power, the Labour Friends of Israel post involves keeping in close touch with the Prime Minister and the Foreign Secretary". On 11 September 2001, within minutes of the terrorist attack on the Twin Towers, Jo Moore, Stephen Byers' spin doctor, sent an email to her colleagues. "This will be a very good day to get out anything we want to bury". Byers has always been a member of Tony Blair's inner circle. The fact that he resigned from office did not affect his close advisory relationship with the PM. In the early 2000s, there were 6 subsections at the Labour Party web site, one of which was titled Get Involved. There used to be a photograph at the top of the page which features eight recognisable individuals. One presumes that those in the photo represented the kind of people that New Labour wished would 'get involved' in their politics and party. Of the individuals shown, there were four black men, one black woman, and the remaining three were young, white women. There were no white men at all. "Promoted by David Triesman, General Secretary, the Labour Party". Former Union leader, David Maxim Triesman was ennobled by Tony Blair and made Baron Triesman in January 2004, was the General Secretary of the Labour Party from 2001 to 2003. He was also a significant figure in the Euro-communist movement of the 1970s. In Blair's third Government, he made the unelected Triesman Parliamentary Under Secretary in the Foreign and Commonwealth Office. In Gordon Brown's June 2007 reshuffle, he was given the post of Parliamentary Under-Secretary for the Department for Innovation, Universities and Skills. Since 2010, he has served Labour as a Shadow Foreign Minister. Other than the fact that he is a Spurs fan, I'm not sure what qualifications got him the job of Chairman of the Football Association in January 2008. Triesman, pictured below, is Jewish. 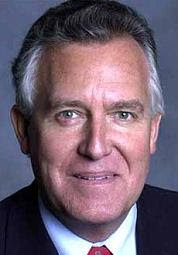 Kenyan-born South African MP, Peter Hain, Minister for Wales, Europe and, latterly, Leader of the House in Tony Blair's New Labour government, was convicted at the Old Bailey of criminal conspiracy in the early seventies. "Local groups and activists have been mobilised throughout the country in preparation for the 'Seventy Tour'... an important part of our build-up strategy will be to mobilise the trade union movement in support of the campaign. This will be an area where we shall need the active support of young workers and particularly Young Communists... We have not been prepared to continue with the tactics of patient petitioning and polite protesting". Hain was also the first leader of the Anti-Nazi League, which organisation was set up in 1976 to combat nationalism in Britain. The Anti-Nazi League was formed by the Socialist Workers Party and the Board of Deputies of British Jews. The founder of the Socialist Workers Party was Tony Cliff, whose real name was Ygael Gluckstein. Gluckstein is, as you might imagine, a Jew. "On 24 July 1964 the African Resistance Movement told the Johannesburg Railway Police that a bomb had been planted in Johannesburg Railway Station. This bomb later exploded, injuring 23 people. John Frederick Harris, a school teacher, was charged with the offence, convicted and hanged. At his cremation the young Peter Hain, whose family had been friendly with Harris, stood up and recited a passage from Ecclesiastes chapter 3: ‘A time to kill and a time to heal; a time to break down and a time to build up.’Hain obviously sympathised with Harris. He thought terrorism could be justified by the motives of the terrorist. In other words, he held the flawed philosophy that the end justifies the means." His published figures show that he spent £82,000 on his campaign, but it is likely that the total was well in excess of £100,000,more than double the amount raised by the winner, Harriet Harman". If Alistair Darling, the former Chancellor and Transport Secretary, was a leading left-winger on Lothian Regional Council before becoming an MP, what of the leaders themselves? What of Margaret Hodge in Islington, Frank Dobson in Camden and David Blunkett in 'red' Sheffield, all leaders of notoriously 'loony left' councils. During her period in charge, Islington schools put boys at the back of the class room during maths lessons in order to raise the girls' standards, grants were given to pro-gay and lesbian groups and the council was committed to a homosexual employment policy. At the same time the council spent heavily and made Islington one of the most indebted councils in the UK. There was one report, which Hodge claimed was untrue, that she had forbidden the singing of Baa Baa Black Sheep in council nurseries because it had racist implications. Another report stated that musical chairs was also on her hit list as, according to the Gospel of Hodge, it encouraged aggressive behaviour. She is also reputed to have called for a ban on skipping ropes and seesaws. "As far as services for children are concerned, we failed. I accept responsibility". At the same time as she was preaching Marx to the multitude, at home, Hypocrite Hodge was practicing something rather different. 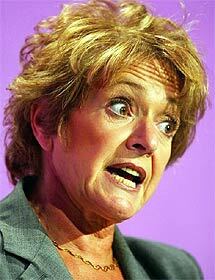 Against Labour Party policy she saw to it that her own children were educated in private schools. Hodge's fellow left-wingers Harriet Harman and Diane Abbot, and Tony Blair himself, would do the self-same thing a decade or so later. The decision by Demetrious Panton, 35, Douglas Fitch, 28, and Yvonne Williams, 40, to come forward throws into doubt how long Mrs. Hodge will remain in post. The three, who were subjected to abuse at the hands of different paedophiles in Islington children's homes, have horrific stories of the suffering they endured in the 1970s and 1980s. Mr Fitch and his brother, Michael, were harassed by Roy Caterer, a sports instructor at a boarding school used by Islington. Caterer was sent to prison for seven and a half years for abusing seven boys and two girls. Mr Fitch claims that Mrs. Hodge should have listened to senior social workers who raised suspicions about paedophiles and has approached lawyers to sue her. He said: 'I hold Hodge responsible for what happened to me and I will not rest until I get justice'. Ms Williams was sexually abused every day from the age of 10 for six years by Jeffrey Wildjones, the superintendent of her Islington-controlled home. Ms Williams said: 'For the sake of all the children she did wrong by... it's high time she resigned'. Mrs Hodge made her political reputation at Islington, where she was leader for 10 years from 1982... She was a close neighbour of Tony Blair. Her husband, Henry Hodge, was a solicitor who gave Cherie Blair her first brief as a barrister. February 1982: Margaret Hodge becomes leader of Islington council..
1995: An independent report by Ian White, Oxfordshire's director of social services, lambasts the council." Margaret Hodge's second husband, Henry Hodge, was a legal high-flyer who just happened give Cherie Blair her first brief as a barrister. At one time the Hodges were close neighbours and good friends of the Blairs. Another of la Hodge's husbands married the former wife of Jack Straw. Once upon a time it would have been called incestuous. These days it's more likely to be described as networking. In June 2003, the Egyptian-Jewish immigrant, Margaret Hodge, (nee Oppenheimer) was appointed Minister for Children by Tony Blair. David Miliband was the Secretary of the Commission on Social Justice from 1992 to 1994. Tony Blair made the 29-year-old head of New Labour's Policy Unit when he became the Leader of the Opposition in 1994 and he remained in this position until parachuted into the safe New Labour seat of South Shields in 2001. In 2002, after just one year as a back bencher, he was given the role of Schools Standards Minister and, in 2004, he was promoted once again to the post of Minister of State for the Cabinet Office. After the General Election in 2005, TB decided to create a whole new department for him and, thus, Miliband became Secretary of State for Community. Ed Miliband was Chairman of Gordon Brown's council of economic advisers before the 2005 General Election, after it, he was the new MP for Doncaster North, another Labour stronghold. He is now, of course, the leader of the Labour Party. To get a grip on how the Chairman viewed the future of the New Labour experiment, let's take a closer look at the man who produced two such indulged and over-promoted high flyers. Adolphe (Ralph) Miliband was born in Brussels on 7 January 1924. His parents were Polish Jews and his father, Sam Miliband, had been a soldier in the Bolsheviks' Red Army. Ralph heard a radio announcement that all boys of his age - he was now 16 - were to be conscripted into the Belgian army... This was not his idea of useful political sacrifice; he decided he would walk to France. At Ostend, they talked their way on to the last boat to England. Once they were at sea, they asked for refugee status. It was granted". "The Englishman is a rabid nationalist... they are perhaps the most nationalist people in the world... When you hear the English talk of this war you sometimes almost want them to lose it to show them how things are". Which does tend to make you think that old Adolphe wasn't exactly all that grateful to those who had just given him and his dad sanctuary. One boiling afternoon during his first summer in London, he went to Highgate cemetery, found Karl Marx's grave and, standing with his fist clenched, swore 'My own private oath that I would be faithful to the workers' cause'. Not that he intended to remain a worker himself: he found clearing bombsites 'an arduous business' and felt a distance from his fellow labourers... He wanted to be an intellectual." 'A grand lad - one of the best I have had in years,' wrote the famous socialist professor, who became a mentor". Harold Laski was the foremost Jewish Marxist teaching in England at this time and, at the time of the landslide election victory of 1945, was the Chairman of the Labour Party. "His lectures taught more, much more than political science. They taught a faith that ideas mattered... he loved students because they were young... he was helping the future and bringing nearer that brave world in which he so passionately believed." "He also believed that... one of the essential causes of the postwar tensions was the determination of the West to pursue its ancient and futile crusade against the idea which Russia had come to embody. And it was one of his most bitter disappointments that a Labour Government should have been willing to pursue foreign policies which only had meaning in terms of an acceptance of the values implicit in such a crusade. The first duty of a Labour Government, he insisted, was to come to terms, despite all difficulties, with the Communist world. Nothing that has happened since he died suggests that duty to be less imperative or less urgent." So, here we see that both Miliband and his mentor, Laski, believed that accommodation should have been made with a regime that had so brutally murdered tens of millions of its own citizens. Most of whom were entirely innocent of any crime. To Panitch, who was also Jewish, Miliband exposed a part of himself that he did not display to his usual, generally secular, leftwing circle: they would sometimes chat in Yiddish. One afternoon while David was still a schoolboy, he was at home studying when the doorbell rang. No one else was in, so he answered it, to find Joe Slovo, head of the military wing of the African National Congress, then engaged in armed actions against the South African government." Jo Slovo was also Jewish. The political climate in our house was generally and loosely left: it was unthinkable that a Jew, our sort of Jew, the artisan Jewish worker, self-employed, poor, Yiddish speaking, unassimilated, non religious, could be anything but socialistic, undoctrinally. The right was taken to be antisemitic, the left less so or not at all - after all Blum was Prime Minister of France." Leon Blum was also Jewish. "It is a great deal easier to attribute social ills to Jews, black people, immigrants, other ethnic or religious groups than to a social system and to the men who run it and who are of the same nationality, ethnicity, or religion." "Ralph relished our political views and encouraged them... It is one of the problems of socialist advance that intellectuals of his like are so hard to come by." Sounds like a lad who must've respected his dad's philosophy then. "David Miliband, the schools minister, and his brother Ed, the chancellor's economic adviser, are set to avoid paying thousands of pounds in tax through an Inland Revenue loophole which the Labour party pledged to close. The brothers, Labour's rising stars, are poised to benefit after their family set up a scheme to share ownership of the family's £1.3m townhouse in north London which was sold recently. The move is particularly controversial for Ed Miliband who is chairman of the council of economic advisers responsible for co-ordinating the Treasury's long-term policy on behalf of Gordon Brown, the chancellor. Brown recently launched a retrospective crackdown on the abuse of similar inheritance tax schemes which will hit tens of thousands of middle-class families from next year. However, the scheme used by the Milibands has been excluded from the chancellor's tough new laws. The Sunday Times has learnt that after Ralph Miliband, the Marxist father of David and Ed, died in 1994, he transferred almost all his assets, including homes in London and Oxfordshire, to his wife. However, after taking professional advice, the family is understood to have posthumously rewritten his will to give 20% of the London home to both David and Ed. Had Ralph Miliband's will not been altered, David and Ed would have inherited the house (or the money raised from its sale) when their mother Marion died and would have faced a tax bill equivalent to 40% of its value. Yesterday a spokesman for the Treasury confirmed that the Milibands had used a deed of variation, saying: 'There is no question of the Milibands avoiding inheritance tax and all taxes have been paid'. A spokesman for David Miliband said that he had no comment". 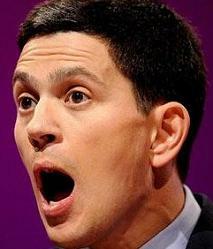 In May 2006, David Miliband became the Evironment Secretary in TB's latest reshuffle. In this positionthe boy wondercould garner tons of non-contentious brownie points by espousing the 'green' cause and seeming to lean on the earth-crushers. Of course, if it was a real appointment, he would have come into direct contact with Tony B's Science Minister, Lord Sainsbury, whose support for everything Genetically Modified was legend. Sainsbury is, as well as having been Chairman Blair's leading monetary sponsor, Jewish. "If we fail.... it will signal a deep and dangerous divide between east and west." "Beyond that we must keep the door open, retaining the incentive for change and the prospect of membership provides." More immigrants for the melting pot project then, eh, David? Yes, I think we know where you're coming from by now. Ed Miliband, a long-serving member of Gordon Brown's inner circle of special advisers, had also been drafted into the Cabinet after just two years as an MP. At that time the second-generation Jewish immigrants were, thus, the first pair of brothers to sit in the Cabinet for nearly 80 years. As of September 2004, five MPs were Ministers within the Department of Education. Three of them, Margaret Hodge, David Miliband and Ivan Lewis were Jewish. This means that, at this time, as the Jews represented about 0.5% of the population of the UK, Jewish folk were over-represented within Tony Blair’s Education ministries by a factor of 120 times. Which isn’t exactly fair, is it? It doesn’t stop there, though. One of the other two Education Ministers, Kim Howells, wasn’t just a former communist, he was also a former President of New Labour Friends of Israel, a powerful, secretive and elite grouping within the parliamentary party. The fifth minister in the Department of Education was Stephen Twigg. Twigg is gay and just happens to have been the President of the New Labour Friends of Israel as well! All of this with a heavy at the helm who just happens to have been the student communists' choice for NUS leader in his youth. In August 1978, Charles Clarke, who was Education Secretary before he took over at the Home Office from the disgraced David Blunkett, paid a visit to Fidel Castro's Cuba. This, in his official capacity as NUS President, along with Peter Mandelson, Arthur Scargill and Brian Wilson, who was to become Trade Minister in Chairman Blair's 1997, New Labour government. The dinner ended with him toasting 'Tony Blair and the third way' while I responded by raising my glass to 'peace and socialism'. I have now had half a dozen such sessions with Castro... Cuba will continue to evolve pragmatically, as it has done beneath the rhetoric for 40 years, in order to defend the integrity of its achievements." Anyway, Charles Clarke appears to have been, in 1978 at least, every bit as much of a Castro cadre as Wilson still appears to be. Castro, by the way, is part-Jewish himself. The very first thing he was moved to do as Home Secretary was to introduce a law which allowed the New Labour government to put anyone they didn't like under house arrest without recourse to the courts. Thus, if Chairman Blair and Vice Chairman Clarke didn't like the look of you, you terrorist, you, they could ring your home with a platoon of Thought Police and away with you, my son! Never to be seen again without their express say so! Speaking of 'terrorists', who is it that’s been importing them into our country against the express wishes of the British people for almost forty years now? Yep, it was the happy-clappy, politically correct Harold Wilson and Tony Blair types, with a bit of help from the Thatcherite fat cats, of course, who were always happy to see the odd 'terrorist' arrive, as long as he would work for less and Big Business could pocket the change. Fact is, folks, Chairman Blair allowed an average of 157,000 KNOWN immigrants into this country every year since he had the top job, and went so far as to say that we NEEDED another 200,000 COMING INTO THE COUNTRY EVERY YEAR to do the jobs the jobs that we won't do any more. So, when TB pretended to ride to the rescue with his 'law on terror', do be aware of what he was really up to and do be aware who created the 'terror' in the first place. THE GOVERNMENT HAD CREATED ITS LONGED-FOR IMMIGRATION BOOM”. And, by the way, Neather wasn't whistleblowing. As the title of his essay, 'Don't listen to the whingers - London needs immigrants' makes abundantly clear, he was gloating. When Charles Clarke was promoted out of the Education department, whom did Chairman B hike up the greasy pole to Cabinet preference in his place? Who did he think would be just the ticket as a replacement for Red Charlie, as the guardian of the educative needs of the predominantly English Protestant tribe? Now we know that truly orthodox Catholics don't believe in abortion or anything other than the most basic forms of contraception. Kelly was certainly right on message in this regard because she managed to pop four sprogs whilst she was an MP. Amongst the interesting notions that Opus Dei are known to promote is that of routine self-flaggelation. I wonder what the Education Secretary thinks about the chastisement of children. Big Brother is now watching us in this respect. New Labour passed another deeply patronising law in 2004, lessening the proles' abilty to discipline their own children as they see fit. I began this essay by pointing out Tony Blair's deep respect for Margaret Thatcher. Given that Thatcher's guru and her first Secretary of State for Education, Sir Keith Joseph, was himself Jewish, we should not, perhaps, be so surprised that a PM who is so in love with all things Hebrew, should have turned out to be her greatest fan. "When he left school he worked as a copy boy on the Communist Party newspaper Daily Worker, was secretary of the Scottish Young Communist League from 1938 to 1941, and had ambitions to become a communist MP. Leo studied law in his spare time and became a barrister and a law lecturer at Durham University. His ambition to be a somebody led him to radical reform of his politics. He became chairman of the Durham Conservative Association and was an admirer of Thatcher and Tebbit. He spent considerable energy grooming his son Tony who, at 12, stood as a Conservative 'candidate' in his school's mock elections". In 1995, Chairman Blair's dad swapped sides once again and joined New Labour. So, parental example has, probably, determined that it is not the extreme right or the extreme left that TB feels uncomfortable with, it's the piggies in the middle. The woman who got naughty boy Blunkett eased out of the Home Office, Charles Clarke ushered in and catastrophically undermined the Jewish hegemony at education, was one Kimberley Quinn/Fortier. Interestingly, before Mrs. Quinn got wed, she was called Kimberley Solomon and she, too, is Jewish. Mind you, Margaret Hodge, David Miliband and Ivan Lewis had all been promoted by our Judaeophilic PM, as had Kim Howells, so Zion really didn't have too much to complain about. Anyway, before the Monica Lewinsky (also Jewish) act-alike wormed her way into the affections of a randy, blind dimwit and a babymaker from over the water got the top job at Education, Our Dear former Leader thought it perfectly right and proper that a left-wing Fidelophile, three Jews and two Zionist wagtails, three of whom are former communists and another a practicing homosexual, should be given the office to devise a suitable system of schooling for our children on behalf of a New Labour administration. Perhaps you think all of the above is perfectly reasonable. Personally, I would rather have an old fashioned assortment of Anglo-British, Protestant English men and women with no homosexual leanings in charge of what our children are taught. A bunch of loony-left Jewish Marxists, Zionist fairies and up-the-duff Miss Whiplashes in charge of what our kids' are allowed to know, think, be and do is guaranteed not to produce an Englishman like my dad.